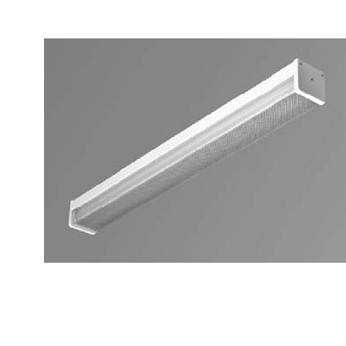 The VANY Vandal-Proof Security Luminaire is available in 18”, 24”, 36”, and 48” lengths, 1 and 2 lamps. 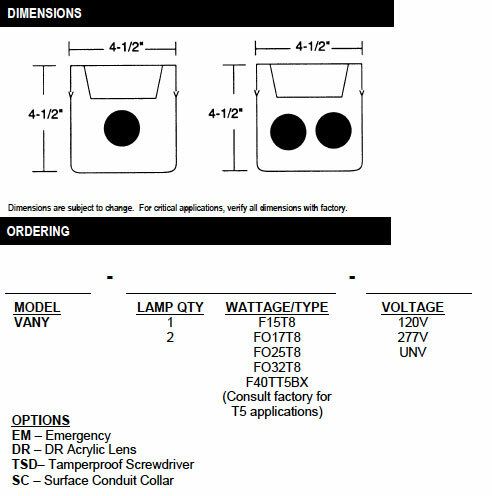 16 gauge design meets or exceeds most requirements for vandalproof lighting installation. Polycarbonate lens is standard. Overlapping end caps are secured by 3 tamperproof spanner head screws. For individual wall or ceiling mount. Can be made for continuous row mounting with optional joiner band. Mounting holes provided in housing for secure bolting to structure. Surface conduit collars optional. Die-formed 16 gauge cold rolled steel. Ends are 16 gauge overlapping type. .125 thick polycarbonate with tongue and groove fit to housing. DR Hi-Impact acrylic is optional. All parts are painted with premium grade white enamel, with minimum 89% reflectance applied over iron phosphate pretreatment, for maximum adhesion and rust resistance.